The pyramids of Germany are known as "cairns" and are the largest megalithic structures on the European continent. Their construction is the 'stone-stepped' design and they can be found throughout the country and the continent. The town of Gympie, at Tin Can Bay, north of Brisbane, Queensland, is the unlikely site of a pyramid complex. The first Europeans to come into the area in the 1830's learned of them from the now extinct Kabi speaking people of Gympie, known then as the Dhamuri. According to the Aboriginals, brown skinned, blue eyed, blond haired beings with Dolphin pendants came from the star Orion and built the pyramids and temple sites, but water came in and destroyed it all long ago. The ruins were taboo to them. Settlers took the stones of the pyramids and other buildings and used them as foundation stones for the main street of Gympie and the construction of buildings, including the local church, which still stands. There were stone statues like the Easter Island statues and also animal statues. These have since been destroyed or are hidden, but photos and sketches of them remain from the first white man to come into the area. Even the tunnels under Gympie were dynamited. All but one of the Pyramids were bulldozed into the ocean by the army in the 1950's and the lone survivor remains on private land with a strict "no trespassing policy". The Pyramid is 100 foot high and designed with a series of terraces up to 4 feet tall and eight feet wide. The army sealed the entrance in the 1930's after investigating reports of cattle wandering into the pyramid, when an opening was still accessible, and never coming out. No reports or findings are available. In recent years, according to locals, the owner has attempted to destroy the pyramid in the hopes of discouraging visitors to the site. Artifacts have survived including the 'Gympie Ape', which was dug up in 1966 and is thought to be a statue of the Egyptian God Horus, who was often portrayed as an ape, and another resembling Ganesha from Indian mythology. A pyramid structure, at least twice the height and dimensions of the Gympie example, has been found near the NSW Central Coast. There is a pyramid on Magnetic Island and a sphinx. The Gympie Pyramid located in the outskirts of Gympie in Queensland, Australia is a terraced structure that some claim was built by ancient Egyptians long before Europeans came to Australia, while others say it was built by an Italian vineyard owner in the 1950s. Constructed from granite blocks, it stands about 100 feet tall. A small idol was allegedly dug up around the same area that some say is a representation of the Egyptian god Thoth in ape form clutching the Tau or the Cross of Life. This statue is now on display in the Gympie Museum. According to Rex Gilroy, the man who discovered the pyramid and who runs the museum, it was created by Egyptians who had mining operations in Australia centuries ago, with bases of operation reaching as far as the Blue Mountains in New South Wales. Other objects have been purportedly found in the area including scarabs, coins and even an Easter Island type head. 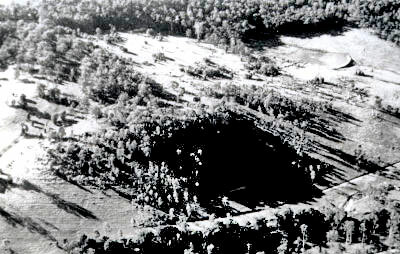 The town of Gympie, at Tin Can Bay, north of Brisbane, Queensland, is the unlikely site of a pyramid complex. The first Europeans to come into the area in the 1830's learned of them from the now extinct Kabi speaking people of Gympie, known then as the Dhamuri. According to the Aboriginals, brown skinned, blue eyed, blond haired beings wearing dolphin pendants came from Orion long ago and built pyramids and temple sites, but water covered them all. The ruins were taboo to them. Settlers took the stones of the pyramids and other buildings and used them as foundation stones for the main street of Gympie and the construction of buildings, including the local church, which still stands. There were stone statues like the Easter Island statues and also animal statues. 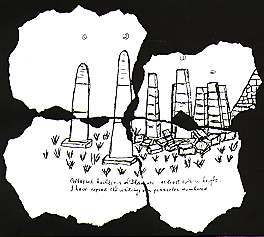 These have since been destroyed or are hidden, but photos and sketches of them remain from the first white man to come into the area. Even the tunnels under Gympie were dynamited. All but one of the Pyramids was bulldozed into the ocean by the army in the 1950's and the lone survivor remains on private land with a strict "no trespassing policy. The Pyramid is 100 foot high and designed with a series of terraces up to 4 feet tall and eight feet wide. the pyramid being on the edge of the former harbor. The army sealed the entrance in the 1930's after investigating reports of cattle wandering into the pyramid, when an opening was still accessible, and never coming out. No reports or findings are available. In recent years, according to locals, the owner has attempted to destroy the pyramid in the hopes of discouraging visitors to the site. 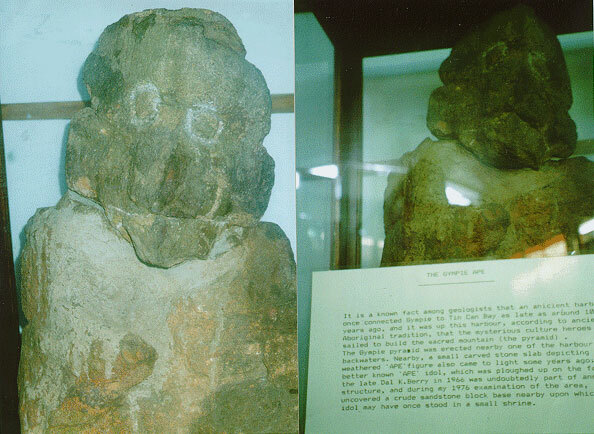 Artifacts have survived including the 'Gympie Ape', which was dug up in 1966 and is thought to be a statue of the Egyptian God Thoth, who was often portrayed as an ape, and another resembling Ganesha from Indian mythology. Egyptian God Thoth is clutching the Tau or the Cross of Life. This statuette is badly weathered with age. Thoth was the god of writing and wisdom, depicted as an ape by the Egyptians until about 1000 BC when he became an Ibis-headed human bodied deity who recorded the judgment of the souls of Amenti, the after world. Thoth's symbol was the papyrus flower. All of this is speculation. China: ver nuestra sección "Las Pirámides Chinas"
Egipto: ver nuestra sección "Pirámides en Egipto"
"El edificio mas antiguo del Mundo: Yonaguni"